Revision rhinoplasty is a surgical procedure designed to repair issues in nasal form or function that result or persist following a primary rhinoplasty. Anyone in reasonably good health, and unhappy with the results from a primary rhinoplasty, may make an excellent candidate for a revision rhinoplasty. Many poor rhinoplasty outcomes can be improved but sometimes there is more risk with having further surgery. What is the youngest age for a rhinoplasty/revision rhinoplasty? Younger patients should hold off on a rhinoplasty until the growth of their nose is complete. On average, this happens for girls between the ages of 14 and 15; boys can take a few years longer to complete the growth cycle. What will happen during my revision rhinoplasty consultation? During the consultation appointment, Dr. Jacono will discuss the results of the previous rhinoplasty, and your aesthetic desires. At this time, Dr. Jacono will also do a pre-surgical evaluation of your nose and face. Computer imaging and Dr. Jacono’s before/after photographs can be a helpful tool in determining the potential results from the revision rhinoplasty. During the consultation Dr. Jacono determines if you need cartilage grafting and if so, if he needs to harvest cartilage from your septum, ears, or ribs. 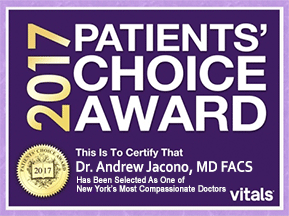 Where does Dr. Jacono perform his revision rhinoplasty? Dr. Jacono performs his revision rhinoplasty procedure as outpatient surgery at a near by accredited ambulatory surgical center. He prefers to avoid general anesthesia so his patients don’t feel sick after surgery. What type of anesthesia is used during the revision rhinoplasty? During the revision rhinoplasty, Dr. Jacono will use a mixture of IV sedation and local anesthesia. How is the revision rhinoplasty performed? Once the anesthesia has been administered, Dr. Jacono will decide whether you will have your rhinoplasty open or closed. From here he will separate the skin of your nose from its cartilage and bone. Depending on the patient’s needs, the doctor may reposition cartilage and replace missing structures. 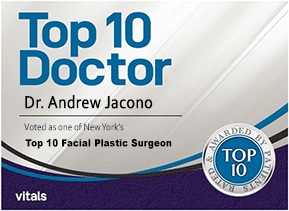 Once Dr. Jacono achieves your desired shape, the skin will be pulled back down and the incisions closed. The incisions for a revision rhinoplasty can be made inside of your nose (a closed rhinoplasty), although in some cases, a smaller incision may be made under your nose’s tip (an open rhinoplasty). How long does a revision rhinoplasty take to perform? While a first rhinoplasty can last an hour or two, revision rhinoplasties tend to be more intricate procedures, lasting two to four hours. Will my revision rhinoplasty scar? Closed revision rhinoplasties do not result in visible scarring, as the incisions are placed inside of the nostrils. However, there may be small scars with open revision rhinoplasties, but these are tiny and well concealed within the natural curvature of the anatomy. Will my revision rhinoplasty be painful? Revision rhinoplasties are often less painful than their primary counterparts. Over-the-counter pain relievers are often sufficient for the discomfort following Dr. Jacono’s revision rhinoplasty procedures. Bruising and swelling are expected following a revision rhinoplasty. Bruising will normally resolve in seven to ten days, however swelling may take several months to dissipate. The discomfort and bleeding after a revision rhinoplasty are often milder than those experienced with the initial procedure. 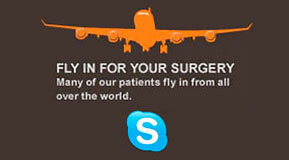 Your splint and stitches will be taken off at the first follow-up appointment, about a week after the surgery. Most patients are feeling well enough to return to work a week after their procedure. Vigorous activities, exercise, and contact sports should be postponed for four to six weeks. Patients should avoid any injuries to the nose or prolonged sun exposure for at least eight weeks. What are the risks and complications following a revision rhinoplasty? Dr. Jacono’s revision rhinoplasty is a safe and extremely effective procedure, although it does carry the small risk for complications. These can include burst blood vessels, excessive scarring, delayed healing, pulling to one side, asymmetry, or the need for additional procedures. Will my insurance cover my revision rhinoplasty? Your insurance may cover the revision rhinoplasty if the surgery is performed to repair nasal function, such as improve breathing. However, if the procedure is solely cosmetic, insurance will not cover the revision rhinoplasty. Contact the New York Center for Facial Plastic and Laser Surgery for information on payment choices and financing options. What is the cost of revision rhinoplasty? Revision rhinoplasty cost varies depending upon the extent of surgery and if cartilage grafts are necessary. Revisions needing rib cartilage grafting are more expensive. How long is revision rhinoplasty recovery? Recovery after revision rhinoplasty is variable. Sometimes this can take months for swelling to go down. For those who have had 2 or more it can take years.